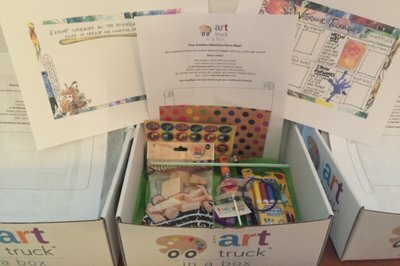 Enter your email address below to receive a notification when Art Truck in a Box starts accepting new sign-ups! 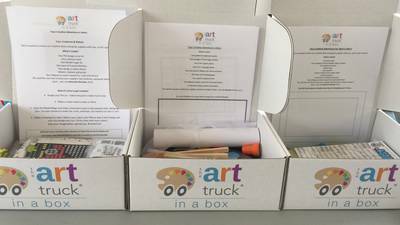 Enter your email address below to receive a notification when Art Truck in a Box is accepting new sign-ups again. We ship on the 4th of every month! 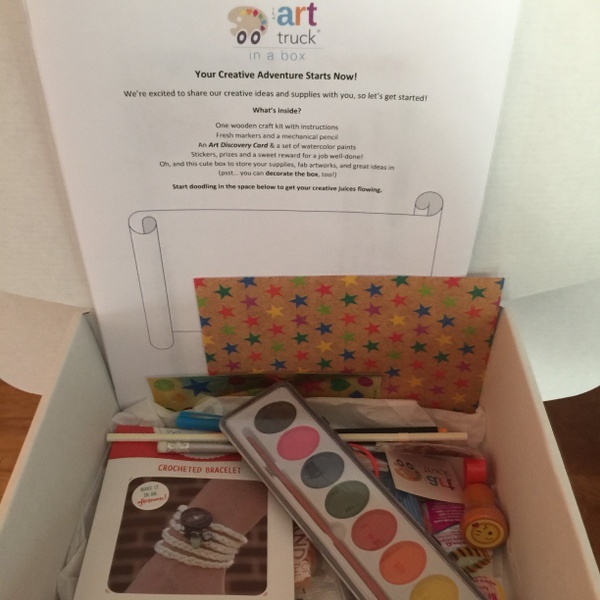 Art Truck in a Box - NEW Art Discovery Box! This was really really bad. 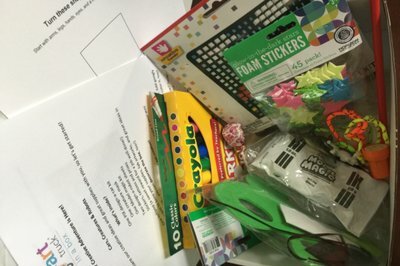 Like the previous reviewer said, the box was filled with photocopies, dollar store trash, and a bunch of other random fall themed things that had no particular use or order. And no prompts either. Made my life MORE difficult because she was confused and annoyed and I had to help her - she's 8.5. 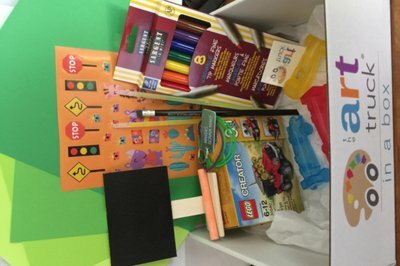 I guess this would be okay for younger ones, but even then you can get everything that came in the box for $10 at the dollar store or Michael's, not $25! I really want a refund. Dear Laura, We are very sorry for disappointing you and your daughter. 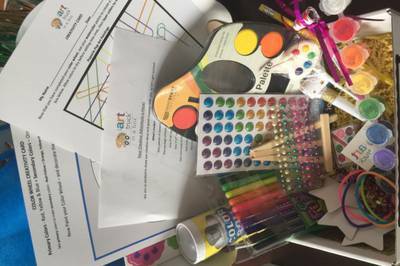 Our mission is to inspire creativity, not confusion or frustration. We clearly fell very short of our mission and will issue you a refund as you have requested. 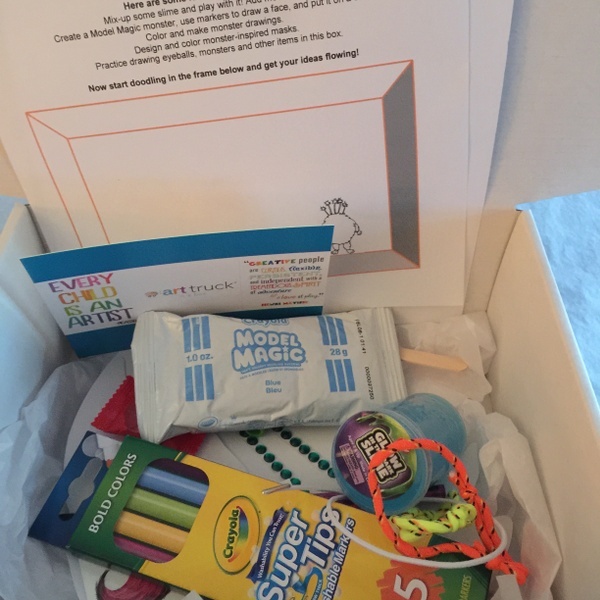 I know it’s a lot to ask, but would you share your thoughts about what your daughter would have liked to see in the box? We’re always going to the drawing board to come up with new products and fresh ideas to improve our boxes. So, we’d appreciate any suggestions you could offer. 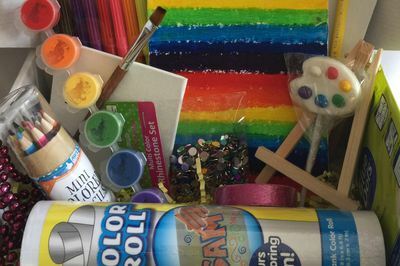 We do include craft and art products from many sources including labels like Creatology/Michael’s, Sargent Art, Crayola, Blick, Hazel & Ruby and more, as well as toys and treats from Oriental Trading and Dollar Tree all of whom offer many quality arts and craft supplies. 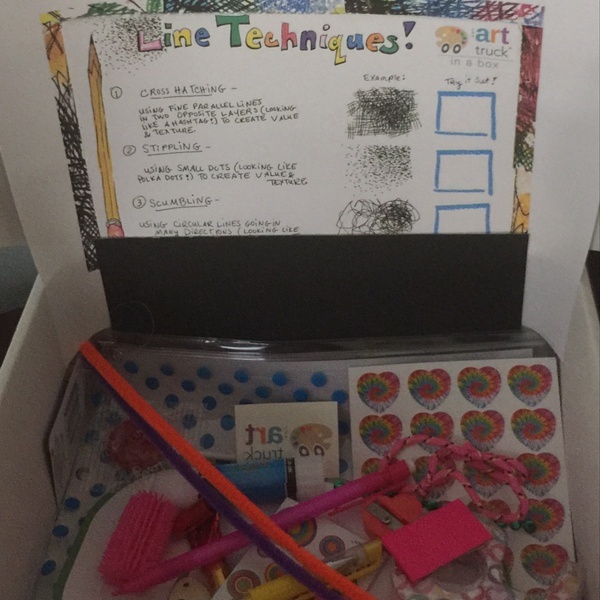 Our recipe is to package one or two easy to follow arts and crafts activities, two idea sheets to encourage drawing, and a mix of die cut and scratch art papers, markers, pencils or pens, stickers and a sweet treat. Again, thank you for your feedback and best wishes for a creative day. My daughter loves these types of materials to work with. 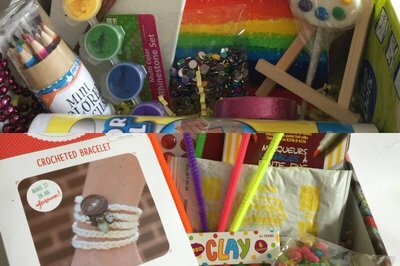 However I could have bought the same supplies and much more of them for the price at our local dollar store. 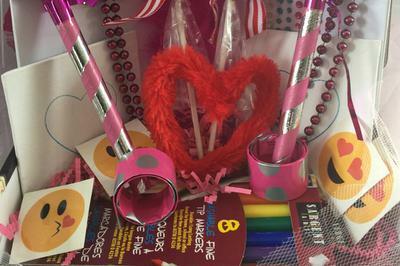 The box is mostly compromised of typical cheap school supply-type odds and ends such as fuzzy pipe cleaners, 2 or 3 foam stickers, a pair of googly eyes, a sample package of wax wiki sticks, some paper cutouts and the like. The box is mostly filled with a packing material compromised of paper shreds which my girl will put to use as decorations on her crafts. Very few materials and very ordinary at that. This all would have been great for the price if it had all been included around one or two major crafts projects that had some sturdy quality to it. So disappointed for my little one. She was really look forward to this box. Sent this to my 9 year old niece. Wasn’t very appealing and the products were ok.
Dear Heather, Thank you for your honest review and feedback. 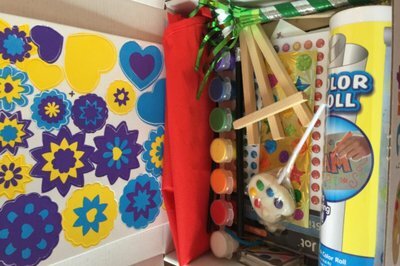 We are sorry to hear that you and your daughter were disappointed with your box. Our mission is to inspire creativity, not disappointment. 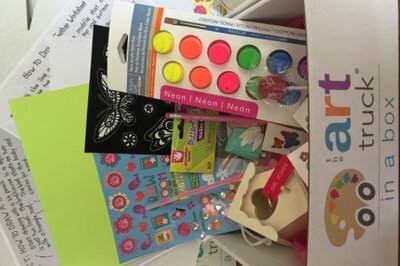 Thanks to your comments and others, we are taking a close look at the age range for our boxes and considering offering a box for ages 5-7, 8-11 and teens. 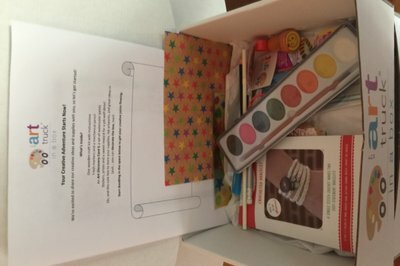 If you’d consider giving us another chance we’d like to send you a fresh box (no charge) with a jewelry or painting theme. Would that be okay? 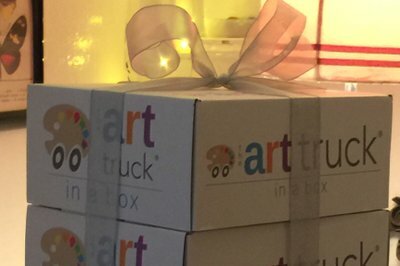 I know it’s a lot to ask, but would you share your thoughts about what you would have liked to see in the box? We’re always going to the drawing board to come up with new products and fresh ideas to improve our boxes. So, we’d really appreciate any suggestions you could offer! 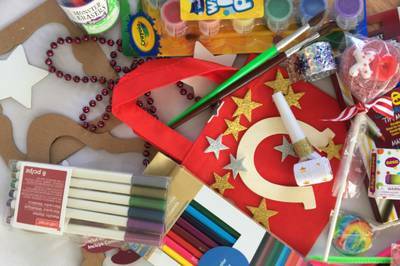 Our recipe is to package one or two easy to follow arts and crafts activities, two idea sheets to encourage drawing, and a mix of die cut and scratch art papers, markers, pencils or pens, stickers and a sweet treat packaged as a gift. 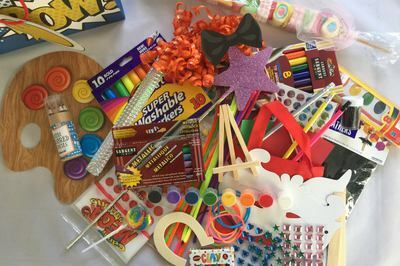 We include craft and art products from many sources including labels like Creatology/Michael’s, Sargent Art, Crayola, Blick, Hazel & Ruby and more, as well as toys and treats from Oriental Trading and Dollar Tree all of whom offer many quality arts and craft supplies. Again, thank you for your feedback and best wishes for a creative day. 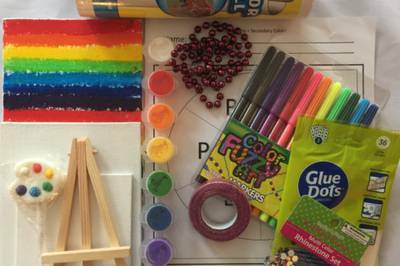 Monster-themed art and craft supplies to sculpt and draw monsters and creatures including model magic, slime, treats and markers. 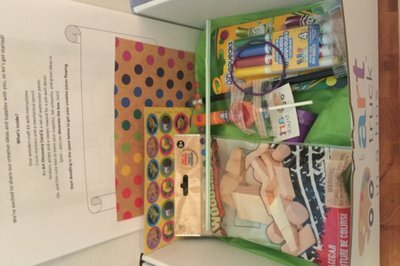 Back to School Box filled with art & craft supplies, pencils, pens, cases, erasers, stickers, plus drawing techniques, treats and more. 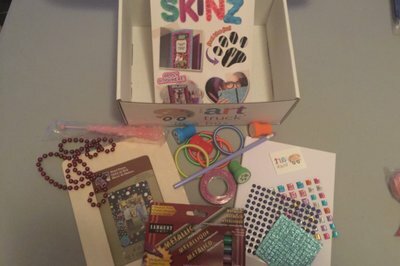 Jewelry making kit, plus special beads and supplies, plus fresh paints, stickers, activity sheets, treats and more.